Peyia, Paphos - Cyprus - This beautifully presented first floor apartment is located in the popular village of Peyia within walking distance to local amenities. 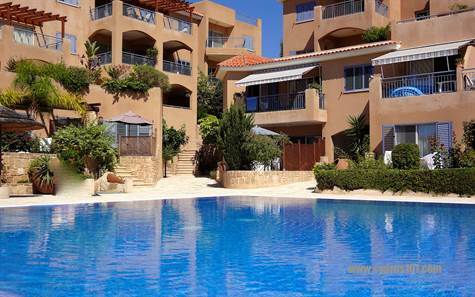 The popular holiday destination of Coral Bay and the beautiful Akamas Pennisula are a short drive away. The property is in immaculate condition and features an open plan living room with lounge, dining area and end kitchen. A granite topped breakfast bar nicely separates the kitchen from the dining area. The kitchen is well equipped with white fitted units, fridge/freezer, built-in oven, electric hob and extractor fan, microwave and washing machine. Large patio doors in the lounge lead on to a good size balcony with space for a table and chairs and loungers. From here you have wonderful sea and rural views which cannot be obstructed. Off the living room is a hallway leading to two good size double size bedrooms with fitted wardrobes and a modern family size bathroom. The property is quality throughout, as is the overall project. There is an amazing pool area with a huge mosaic tiled swimming pool and showers to the side. The surrounding terrace has lots of space to relax and unwind with permanent thatched umbrellas in situ and sunbeds provided. In summary, a perfect holiday home/rental investment, fully furnished with title deeds. Please refer to MLS# 1096 when inquiring.